While there are still some beloved and frequently seen movies left in my Oscar lists, I am getting to the point where a lot of what I still have to watch are films that are pretty much forgotten. That’s absolutely the case with The Royal Family of Broadway. Honestly, I’m just happy that there was a version of this to watch on YouTube. This film evidently exists in terms of physical media only in a UCLA vault as a 35mm print. That there are versions that appear online is fortunate, because it would be easy for this to be a completely forgotten film. The Royal Family of Broadway was evidently based on a stage play, which was itself a rough biography of the Barrymore family. We’re going to be spending a good bit of time with our theatrical family and dealing with all of their different foibles. For what it’s worth, there are going to be four main members of the Cavendish family that we will have to deal with. Fanny Cavendish (Henrietta Crosman) is the family matriarch and absolutely convinced that life in the theater is the right life for the whole family. Her daughter Julie (Ina Claire) is a stage actress as well, but is considering getting married to wealthy financier Gilmore Marshall (Frank Conroy). Julie’s daughter Gwen (Mary Brian) wants to marry Perry (Charles Starrett) and give up the life entirely. 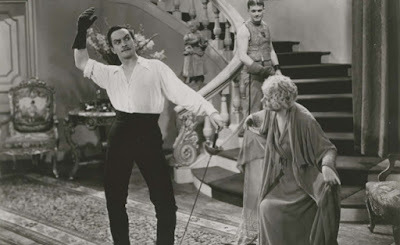 And then there is Tony Cavendish (Fredric March), the family’s prodigal, who has gone out west to be in movies and, because of his wild ways and wantonness, has been forced to leave the coast, return to New York, and attempt to book passage to Europe on Aquitania. …And that’s it. Really. That’s the entire movie. Gwen wants to get married and the rest of the family doesn’t want her to. Julie considers getting married despite the fact that she may not really have much of a life with her husband. Fanny basically acts all the time no matter what is going on around her. And Tony is basically Errol Flynn. Technically, Tony is John Barrymore. He shouts a lot, runs around with a stage sword, and generally freaks out. I’d love to wax rhapsodic here about The Royal Family of Broadway, but there genuinely isn’t a great deal to talk about. This is one of those pre-Code films that seems to have been produced simply because it was exciting for people to have movies with sound in them. There is a particular joy to the pre-Code era, though. When Tony first shows up, he declares that he needs a bath and proceeds to walk through the family house disrobing. This concludes with him stripping off his shorts as he walks out of the frame and proceeds to him in the shower, just barely avoiding displaying himself to his family and the audience. It’s so entertaining to see this in a film from the 1930s. Beyond that and March’s generally manic performance, the main draw here is Ina Claire, who comes across in this film as the one aspect of the film that is wildly ahead of its time. This isn’t specifically the case in what she says or does, but in the way she looks and acts. Claire comes across as surprisingly modern, as if she popped in from thirty or forty years from the film’s future. Otherwise, there’s just not that much here. The Royal Family of Broadway is entirely harmless as a film, but it’s also one of those films that made virtually no impression on me. I can’t really imagine that my life is now any different than it was before I saw this movie. There’s so little here to discuss that I kind of wonder why I watched it. It has one of the only two or three endings it could have, and the one we get is the one that is the most easily predicted. Other than March and Claire, there’s nothing to see. That’s a shame, because Mary Brian surely could have been used more and better here. Ah, well. Many of these early talkies have the same problem; people were so excited that the movies had sound that they didn’t really much care about what they said. Why to watch The Royal Family of Broadway: Fredric March’s manic performance and Ina Claire’s performance in general. Why not to watch: There’s a reason this has never made it to DVD or VHS. I liked this more than you it seems. The story isn't deep, though from what I read its pared down considerably from the stage play, but it's lightweight and fun in a throwaway manner. I liked Ina Claire as well. Her look is very modern and she gives a good approximation of Ethel Barrymore (apparently so good Ethel threatened legal action). She really nails her final scene. I also liked Henrietta Crosman as the matriarch patterned on Georgiana Drew. Her theatrical self involved "The theatre is LIFE!!" attitude goes a long way to explaining why her children are the way they are. So her big gestures make sense. But it's Fredric March (who there for a minute I truly thought was going to moon us!) and his hugely expansive highly amusing turn (which John Barrymore unlike Ethel found hysterical) that steals the show. He was such a talented man, adept at both comedy and drama as he showed time and again its too bad he isn't better remembered. I think that might be partly because he didn't have any characteristics that were inimitable like Jimmy Stewart's drawl or Cagney's rat-a-tat-tat delivery or Bette Davis's gestures and clipped speech etc. that kept them favorites of impressionists and therefore kept them vivid in people's minds. Outside of their performances the picture is rather primitive and I don't see myself watching again but since it is so close to lost it's great that there is a print (rough though it is) out there. I found that several films I've been looking for are in a similar state of only existing at UCLA but with them its the only one available and since I live on the other coast the chances of seeing them is nil. At least they're not lost like so many. Ultimately, I think The Royal Family of Broadway is a great deal less than the sum of its parts. There are some really good elements here, and there could be a pretty good movie fashioned from them. The whole thing is so fly-away, though, that it seems like a waste of some prodigious talent. Your comments on March remind me of why I think Paul Muni tends to be forgotten these days, at least in part. Muni didn't have a specific characteristic and was such a chameleon that it was easy to lose him in parts. For me, March will always be Matthew Harrison Brady, and thus will always be memorable.